Three years ago, Yaki and I moved back to Beersheba, the sleepy college town at the edge of the desert where we first met. I began a master’s program, and we lived in a little house with a garden. I remember one night clearly: I was walking home from university, the sky already dark, the streets quiet and empty, cats curling up in the shadows. I was on the phone with a friend, and she was asking how I was doing, and I remember telling her that everything was just wonderful. I remember that moment clearly- I remember exactly where I was: in the middle of crossing the street at the intersection right across from our home; I remember how my backpack weighed heavily on my shoulders. I remember pausing for a moment, struck by how deeply I meant it. A few days later, the bombings began. The first siren hit me completely off guard. Yaki was driving back from a wedding near Tel Aviv, and I was home alone. I walked to the bathroom, which was a teeny stall, closed the door, and slowly sat down on the floor, bringing my knees to my chest. I reached for a magazine from the rack hanging on the wall, rested my forehead on my knees, and held the magazine on top of my head. The siren was long and resounding, and I waited there wedged between the door and the foot of the toilet. I heard a loud blast. It sounded close. Yaki came home a little later, and I didn’t give it much thought. In fact, I remember thinking to myself that if that’s all it was, I could handle it. There had been talk in the media of missiles from Gaza reaching Beersheba, but it had never happened before, and it seemed rather far-fetched. No one seemed to be taking it too seriously. The next day, a siren sounded in Ashdod, a city with a similar proximity to Gaza as Beersheba. Two sisters driving home from the gym stepped out of their car to seek shelter in a semi-covered bus stop. The missile exploded into a hundred fragments, letting loose a cocktail of bolts packed tightly into the missile head, killing one woman in the arms of her sister. The women were Yaki’s cousins. I started panicking. Our home was a single-story affair, without a bomb shelter and ultimately no place to hide. It didn’t take long for me to realize that holding a magazine on top of my head wasn’t going to cut it. I took a taxi to my friend Debbie’s house, which had a bomb shelter. I remember trembling during the entire ride, unsure what we would do in case a siren caught us on the road, trembling with fear. Later that day, I took a train to Tel Aviv, and then to Jerusalem. A siren sounded when I was at the train station, and everyone dropped to the ground, covering their heads with their hands. Students, young soldiers in uniform, guns strapped across their chests, children. I remember heaving a deep sigh of relief when the train neared Tel Aviv, out of the missiles’ range. I spent a little over a week in Jerusalem. I remember everyone acting nonplussed, almost unconcerned. Each area of Israel has its own story, its population a unified group sharing a similar history and experience. For Jerusalem, it’s terrorist bombings in buses and cafes; terror striking when you least expect it, while you’re on your way to school, or sipping a coffee with friends. No sirens warn you to take cover. You learn to be on the lookout when you get on a bus, on the lookout when you’re out having fun. We had a wave of bombings while I was in high school, and for nearly a year, I wouldn’t leave my house unless it was absolutely necessary. I’ve gotten off of buses countless times, triggered by a man carrying an unwieldy briefcase, or a woman in a bulging coat. The bus I took to school passed for approximately five minutes through a Palestinian village. One day, a bus that left fifteen minutes after mine was attacked by gunfire, killing a young girl from my high school. The funeral took place that night. It was dark, and we were all gathered outdoors, and her best friend screamed out her name incessantly. From that day on, those five minutes were torture. As the bus made its way through the winding streets, I imagined guns aimed at me from every corner, by men in the distance on rooftops, by teenagers lurking in alleys. Rocks thrown at buses were routine, but after this incident, my heart would leap into my throat in the millisecond it takes to differentiate between a rock and a bullet. “Operation Cast Lead” took place in the middle of the semester, so eventually I had to return to Beersheba. At first, I couldn’t sleep. I would wait until morning, and walk to the campus, where I would make my way to a computer room housed in a bomb shelter. I would put my head down, and fall asleep. After a while, I started getting worn out, and falling asleep at home. Any little sound would jolt me out of my slumber. Our house was situated on a road that led directly to a hospital, resulting in a lot of ambulance traffic. I had never really noticed them before, but now I did- the beginnings of their sirens sounded just like the missile raid sirens. Both began with an incredibly high pitched wail that hit you, not at your ears or your face, but seemed to pierce right through your ribs, sharp as the edge of a knife. My body would freeze immediately. If it grew louder, the wailing frantic and relentless, on a deafening, rolling loop- it was a siren, but if it grew softer it was an ambulance, driving away. As the weeks passed by, the fear slowly receded to the background, and my body began to relax. I thought about it (missiles, sirens, war, death, life) a few times a day, rather than a few times an hour. Then, out of the blue, weeks after the ceasefire, a siren woke us up in the dark of the night. And just like that, my nerves unraveled, and I slipped right back into the bottomless pit of fear I had been clawing myself out of. I remember that phone call so clearly, that moment when I said everything was so wonderful, because things never returned to that calm again, that unbridled state of peace. My two years in Beersheba were undercut by fear, my body never completely letting go, my mind never completely at ease. Sometimes the panic would come back, out of the blue. I would be lying in bed opposite Yaki, and he would be fast asleep, and all of a sudden the panic would slowly get a grip on my mind, escalating, and I wouldn’t be able to fall back asleep. The silence seemed thick, pregnant. The knowledge that it could be pierced at any moment with the wail of a siren, pecking away at my mind, until it felt like it was about to burst. When we moved to New York, one of the first things I noticed was the quiet. I can drift into sleep, without fear taking hold, grabbing me by the neck, holding me in its tightening grasp over the edge of slumber. I’m an ocean away as the south of Israel is once again under missile fire. My heart, my mind… is there. *I’m eyeing this Guinness Chocolate Cheesecake, this Cheddar Guinness Dip, and this entire roundup by Megan of Take a Megabite (s’mores with stout marshmallows + ganache, chocolate stout waffle s’mores, mini Hacker-Pschorr cupcakes, and more!). P.S. If you’re in the mood for a little internet browsing, Heidi’s recent favorites list is a perfect starting point, as is Kimberley’s. 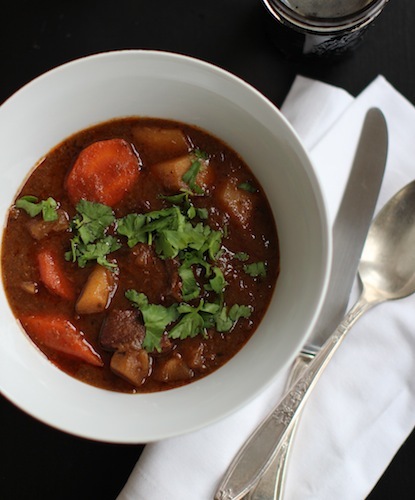 This stew simmers for close to 3 hours, resulting in a heady, rich broth, and fork-tender beef. 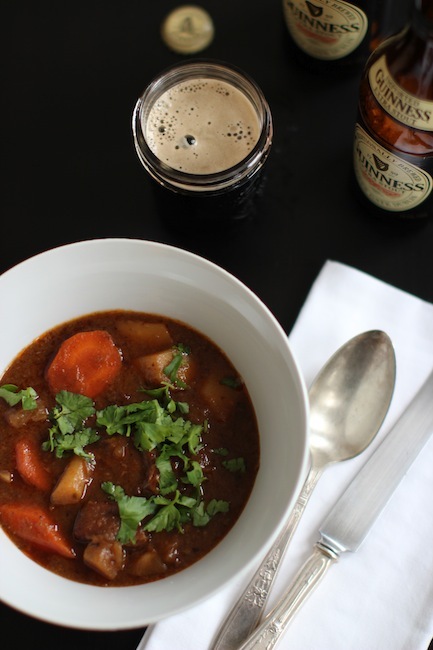 The Guinness lends complex caramel flavors, and a gorgeous dark hue. Adding the vegetables once the beef is cooked allows you to cook them until they are perfectly tender. 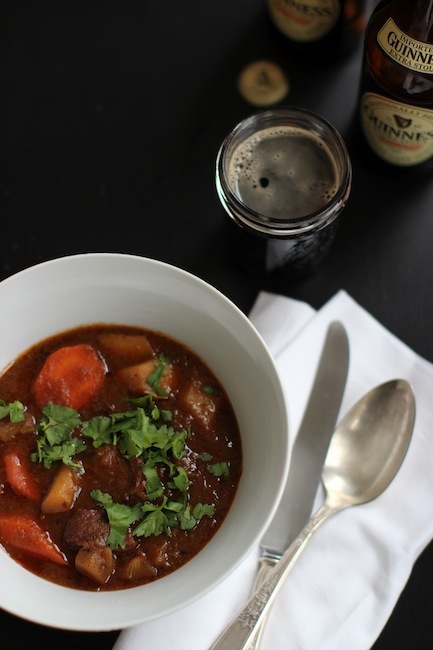 This stew is hands-down the best I’ve ever made. It tastes even better on the second day, making it the perfect thing to make ahead for guests. We served it plain the first night, and on a bed of couscous the next (other grains such as farro or brown rice would work well too). 1. Heat half of the oil in a Dutch oven (or large pot) over medium-high heat. Place flour in a shallow dish. Sprinkle beef with half of the salt, and dredge in flour. Add half of beef to pot, and cook for 5 minutes, turning to brown on all sides. Remove beef from pan with a slotted spoon, and repeat with remaining oil and beef. 2. Add the onions to the pan, and cook for 5 minutes or until tender, stirring occasionally, and scraping the bottom of the pot to loosen browned bits. Add tomato paste, and cook, stirring, for a minute. Stir in broth and beer, and return beef to the pot. Add remaining salt, raisins, cumin and pepper, and bring to a boil. Cover, reduce heat to low, and simmer for one hour, stirring occasionally. Meanwhile, prepare the root vegetables: peel the carrots and parsnips, and slice them into thick diagonal slices (about 1/2 inch thick). Peel and cube the turnip (also 1/2 inch thick). Uncover the stew and bring to a boil. Cook 50 minutes, stirring occasionally. Add carrots, parsnips and turnip to the stew. Cover, reduce heat to low, and simmer for 30 minutes, stirring occasionally. Uncover, and bring to a boil, and cook for 10 minutes or until vegetables are tender. 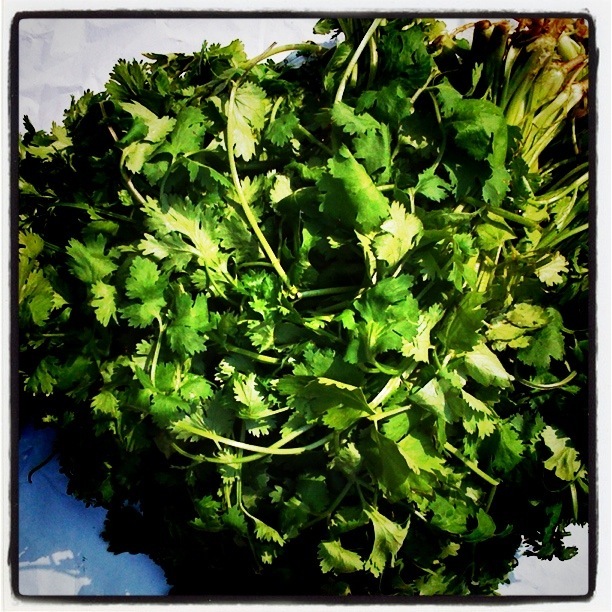 Garnish with parsley or cilantro. Thank you for sharing such a personal story. I am reminded of how fortunate I am to be in a safe place. A bit of Guinness makes everything better. Even the soul. Tuck Shop in the East Village has a good Guinness meat pie. You crack me up with your restaurant recommendations! Can you believe I had never tasted Guinness before? I have a lot of catching up to do! it’s a chilling story…unfortunately few people realize it..When at the news they say “no wounded”…It does not reflect the reality! In fact no one refers to the mind…the number of “wounded” can’t even be accounted for!!! I certainly wasn’t expecting this when I first read your blog post today! How awful to have lived through this.. I have lived in Canada my whole life so I definitely take our peaceful way of life for granted. Excellent writing and an excellent recipe today!! Just wanted to say hi, and that I completely related to every word.. we should hear good news.